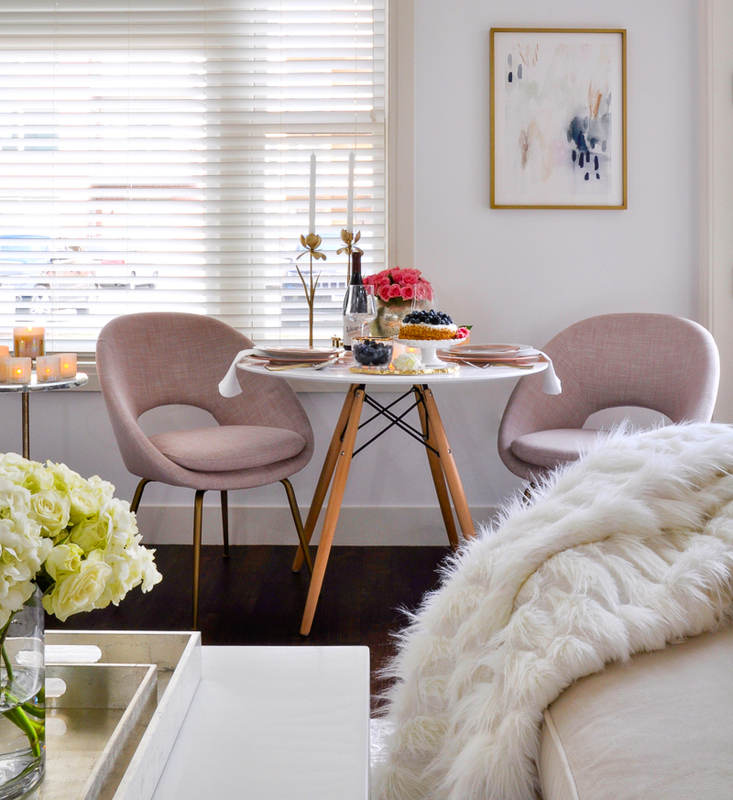 Welcome to our Styled + Set Valentine’s Day blog tour! 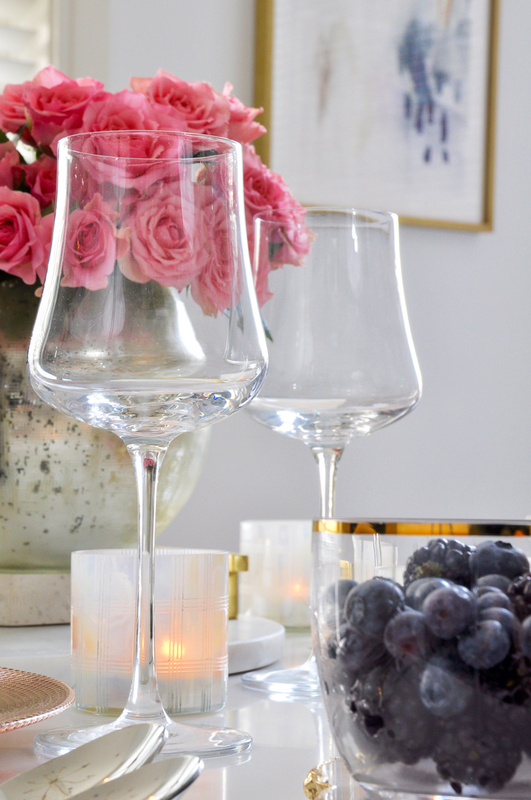 Today we are sharing our Valentine’s Day entertaining ideas. If you found your way here from Setting for Four, thank you for visiting! Also, a big thanks to Lory from Designthusiasm. She works very hard to organize these holiday blog hops so you will be able to gather many ideas at once. Valentine’s Day is most definitely one of my favorite holidays. I have many memories of wonderful dinners with Tony. He does an amazing job of planning special evenings. We LOVE going out, but we also love to stay home and have figured out how to make an evening in just as special as an evening out. 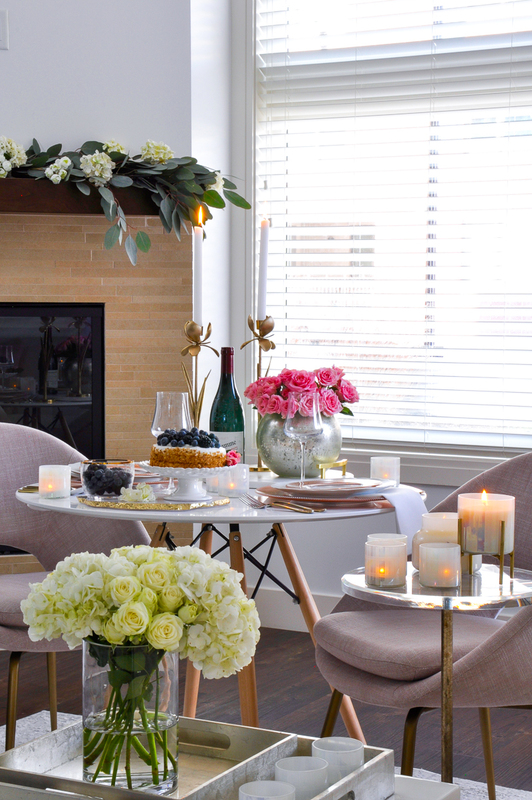 Because restaurants can be so crowded on Valentine’s Day, I want to show you how to make dinner at home romantic and memorable. 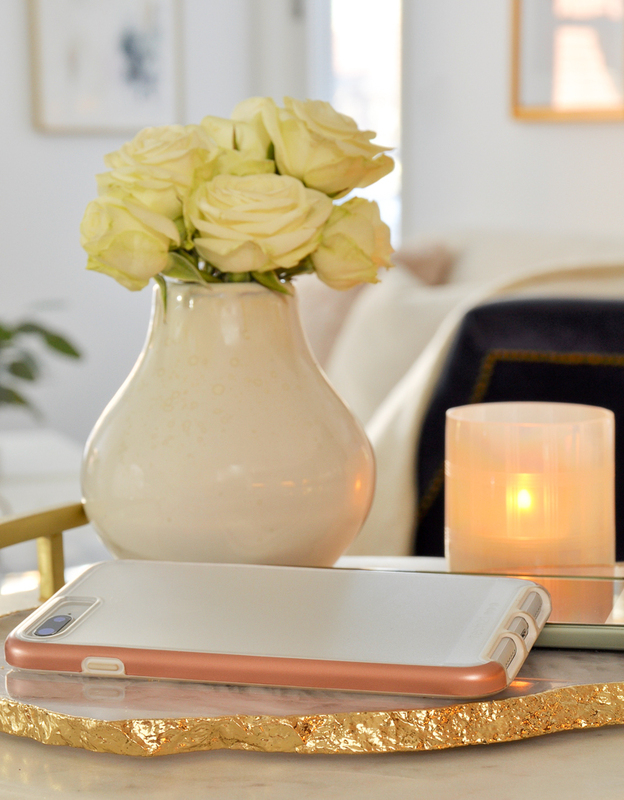 Let’s be honest….don’t we all need a little more time without our phones nearby, ready to distract us? 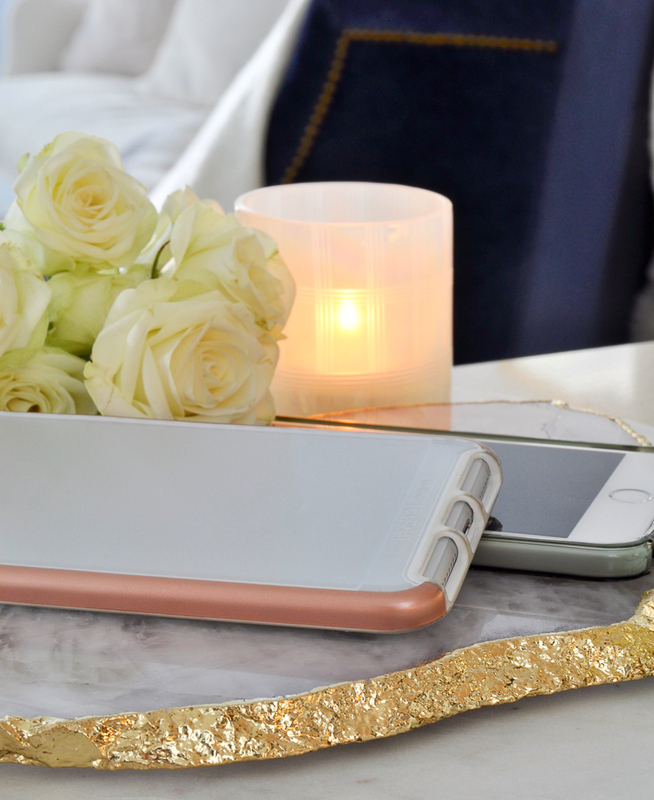 For Valentine’s dinner, try setting your phone aside. I know you won’t regret it. And perhaps you will want to set it aside more often! As a side note, if you’ve been watching The Bachelor, you may have seen the “first impression rose” on this tray with the gold edge. It’s actually a cheese board and one of the most beautiful accessories I’ve ever found! 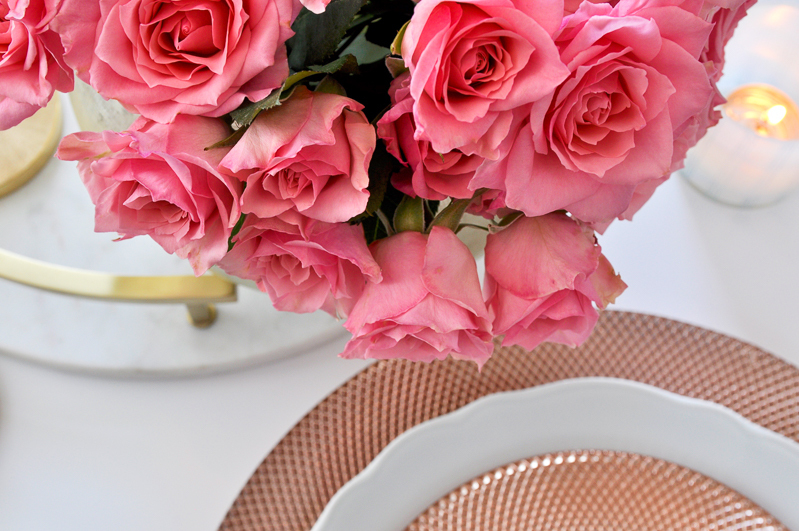 I used everyday white dinner plates and I added some rose gold chargers and salad plates. 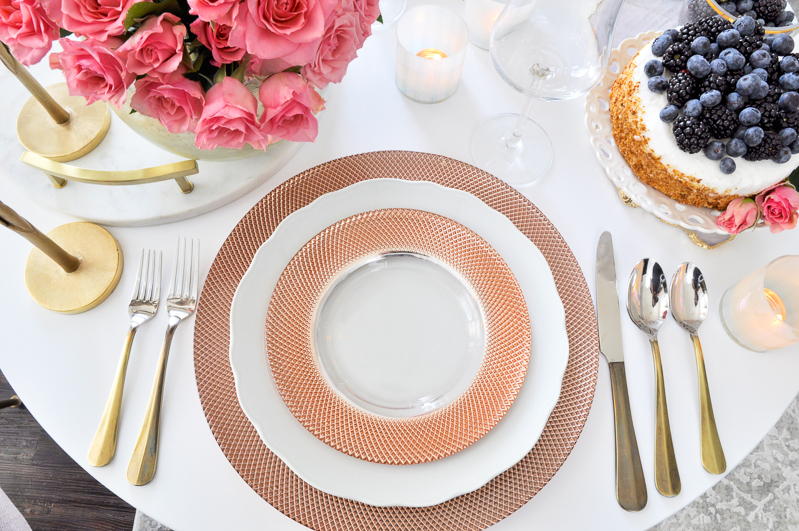 Try mixing chargers or salad plates with your white dinnerware for a pop of color. This is one of the rare times that more is more! You really can’t have too many candles on Valentines Day. 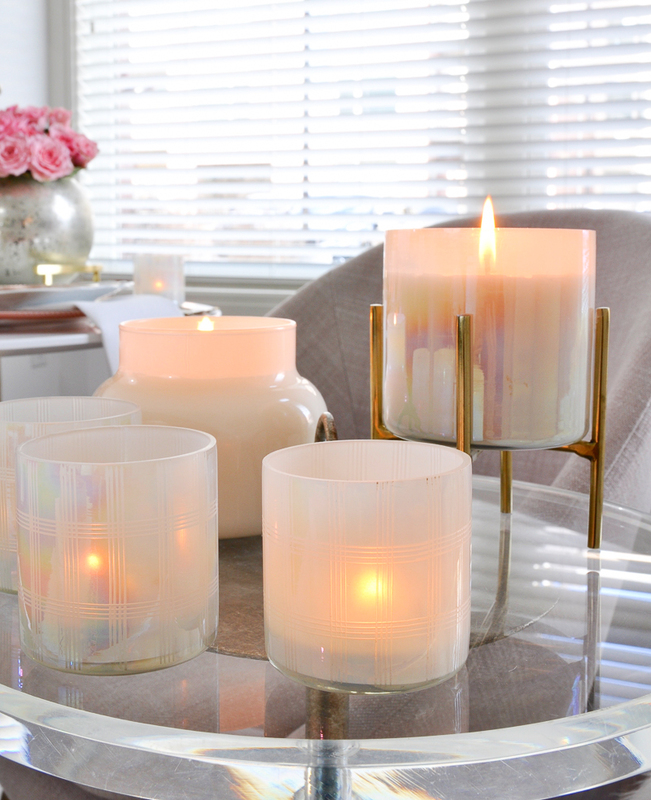 I found these fabulous brass taper holders for height and kept the rest of the candles small. A few extra candles fit perfectly on a drink table which I set off to the side. 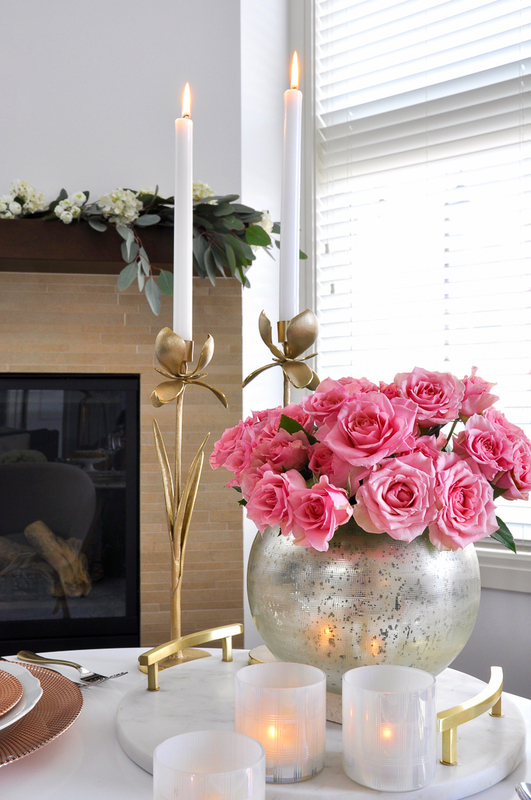 Okay, so your husband may not care if you include flowers, but chances are, you will enjoy them. And they definitely add a romantic vibe. These pink spray roses are just a few dollars at the grocery store. 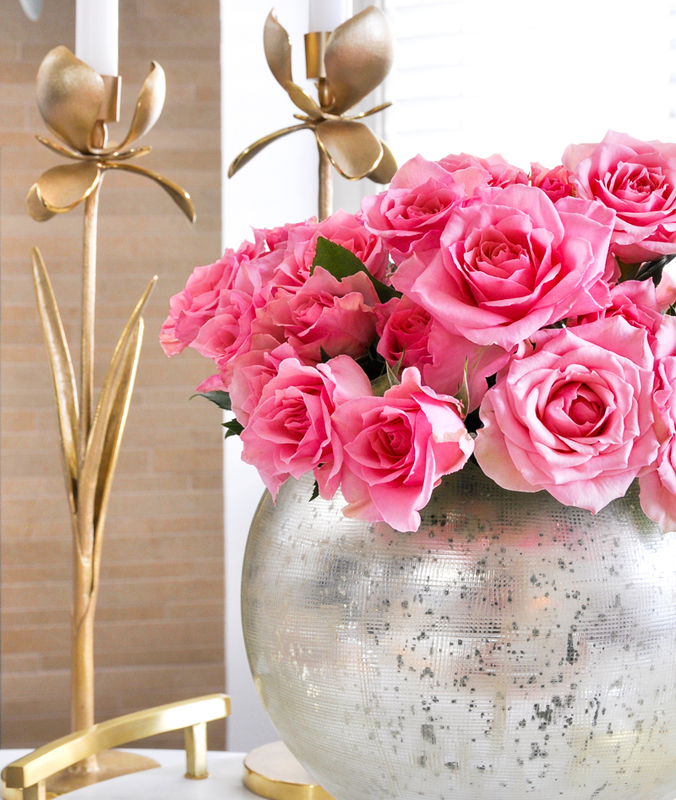 Try using a round vase in silver or gold for a glamorous look. You can also elevate them for extra height. I used a marble tray to raise them up a bit. If your husband brings you flowers too, how wonderful! 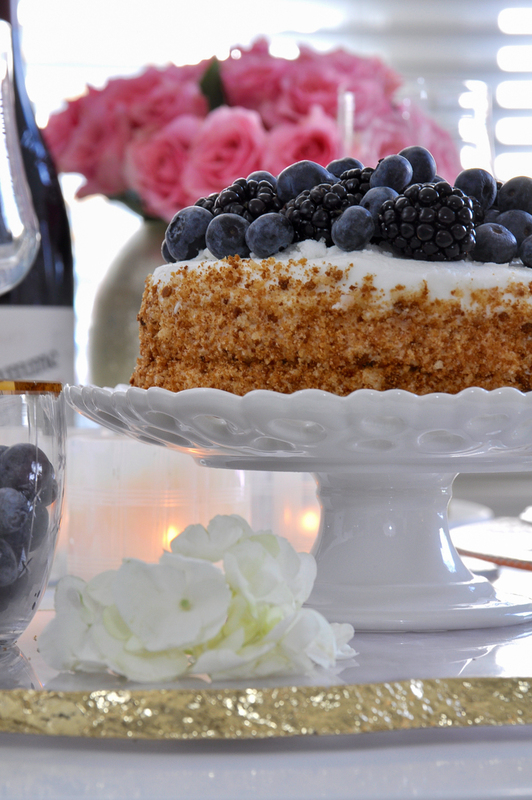 Even if you decide to have your main course out, there is something incredibly romantic about dessert at home. 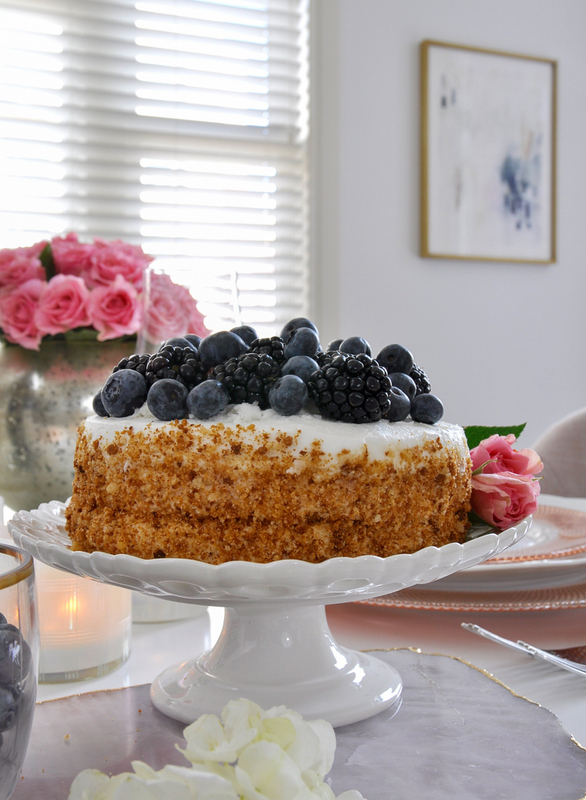 I kept it simple with a small lemon cake from my local grocery store. 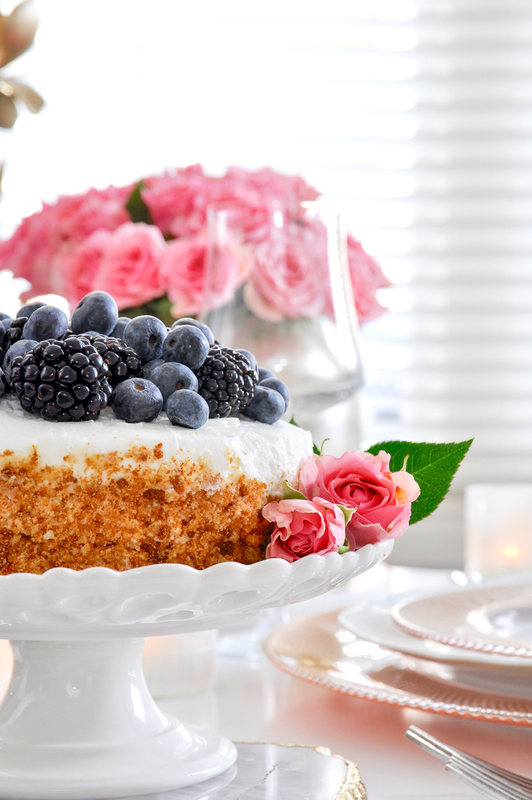 Simply removing it from the container and putting it on a cake stand makes it beautiful. 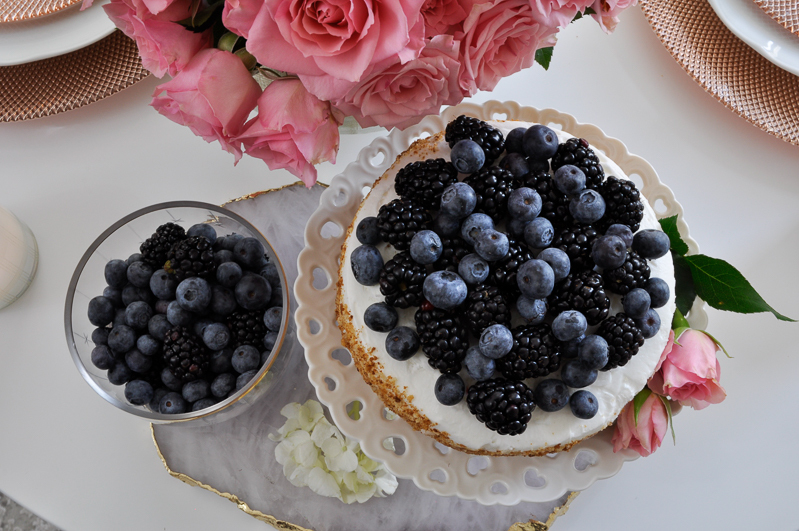 For an extra layer on top, I added blackberries and blueberries. 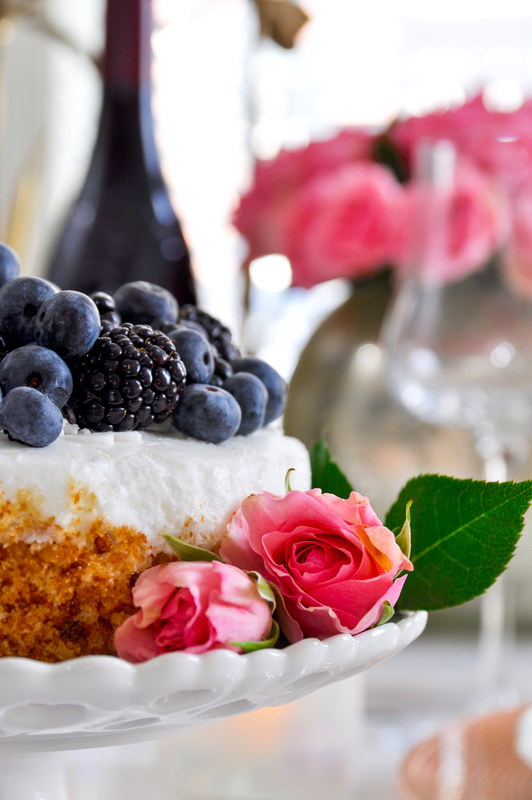 Raspberries or strawberries would also be beautiful. Romantic, right? I hope you’ll try a date night at home, whether you do it on Valentine’s Day or any other day of the year! For those of you who are frequent visitors, you may not recognize this spot. It is part of our Colorado home which is becoming more and more complete by the day! 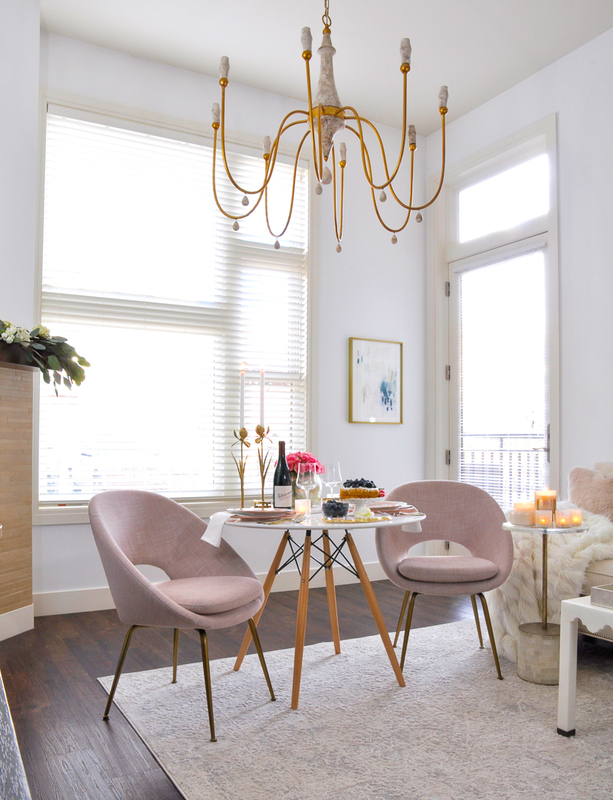 The table was borrowed and I found the cute blush chairs at a favorite store of mine, West Elm Boulder. Be sure to check back because a full tour will be coming soon!!! Thank you for visiting!!! Your next stop is Designthusiasm! 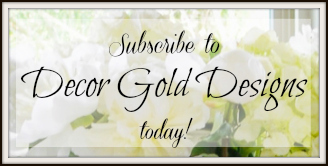 After reading Lory’s post, be sure to visit all of the bloggers on our tour. They are very talented. Linking with BNOTP and Feathering My Empty Nest. And I’m so glad you mentioned where the photos were, because as I was reading I was thinking “what room is this that I’ve never seen? !” Can’t wait to see the whole space when you’re all done! Thank you sweet Bree! I am excited that it is finally coming together! Love the darling table set for two! And seeing another design style taking shape…love the new pad! What a beautiful setting! Date nights at home are the best. This is so pretty, Jennifer! Such a romantic table setting.